Going en pointe is our next new adventure for some of our students at The Life & Soul Academy. Getting to this level of ballet takes dedication, determination and grit as it certainly isn’t the easiest of things learning to balance on the end of your toes! Throughout February we want to take things back to basics and teach our students and readers about the pointe shoe itself as well as tips and tricks to being the best en pointe. Also known as the block, it’s the hardest area of the pointe shoe and is the section used to stand ‘en pointe’. It is usually made up of layers of special fabric which are bound together by a paste between each layer. The box can vary in shape and size depending on the brand of shoe and the width of your foot. The vamp refers to the length of the shoe measuring from the platform to the binding at the front of the shoe. Dancers push the front of their foot in the shoe to achieve being ‘fully’ en pointe. The seam runs around the top of the pointe shoe and hides the drawstring. When you fold the back of the pointe shoe over the back of the heel you get the ‘quarter’ of the pointe shoe. 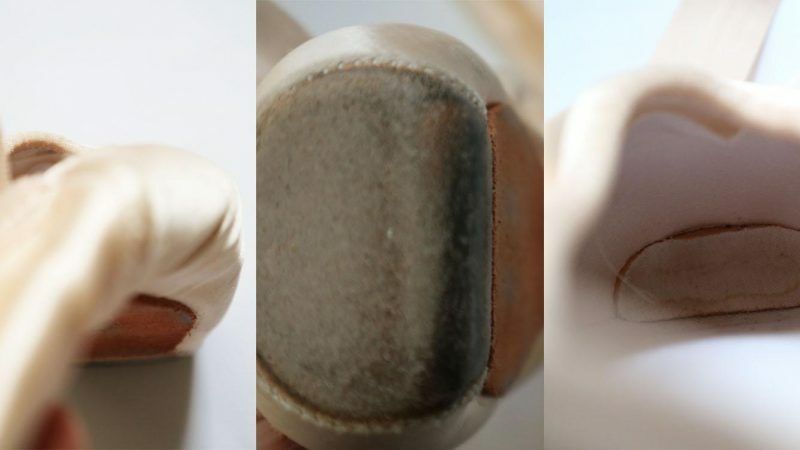 Some dancers remove part of the inner shank of the shoe typically leaving 3/4 of the inner sole remaining. Some dancers also use the quarter to sew their ribbons in. Dancers sew on ribbons to keep their pointe shoes on their feet. They tie around the lower part of the ankle. Dancers can use elastic across the pointe shoe to add extra support when up en pointe. They are sewn 3/4 up on the shoe and are typically placed alongside the ribbons. This is the bottom of the pointe shoe and is typically made out of leather. Depending on the design of the shoe it can either have a full sole which is just one piece of leather or a split sole which has two separate sections – one for the ball of the foot and a second part for the heel. A split sole doesn’t have a section for the arch of the shoe to make your foot easier to point in. This is the flattened surface right at the end of the shoe which you use to stand ‘en pointe’. 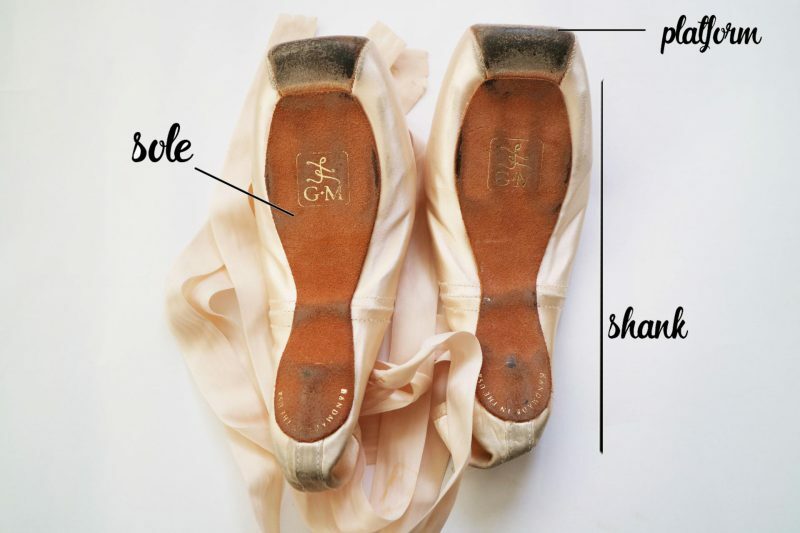 It is also referred to as the box on the pointe shoe but refers more to the flat surface opposed to the whole ‘box’ section. The shank supports the whole pointe shoe and acts like the shoes spine. They are made up of layers of material in different materials and styles to provide a certain amount of stiffness to the shoe. Dancers may feel like they need a stronger shank to help keep them ‘en pointe’ giving them more support whereas others may prefer a flexible shank to help make their feet look more pointed and curved. 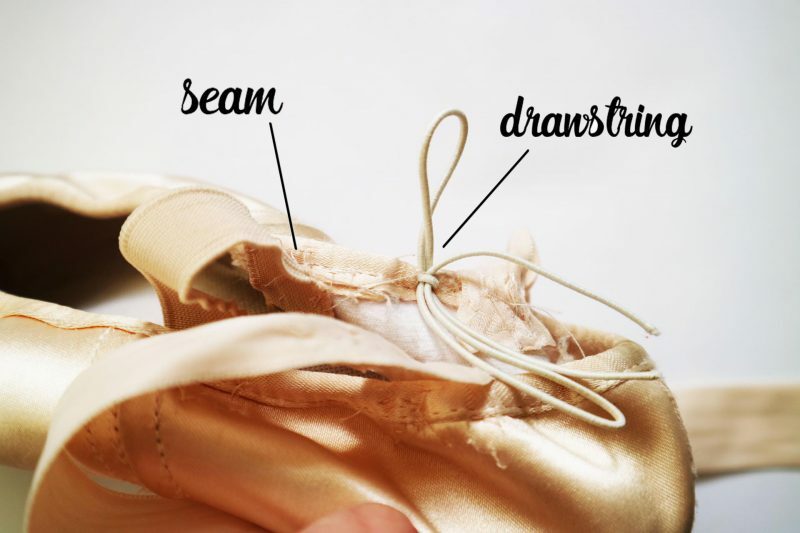 The drawstring runs around the pointe shoe inside of the seam. This can be found at the front of the seam or at the side like the one shown above. Dancers tightened the drawstring to add extra support to their shoes creating a snug fit. Tying your pointe shoes is vitally important to give you the correct support whilst you are up en pointe. We have found a great blog post from blogger ‘Pointe Til You Drop’ where we couldn’t have put it any better ourselves. 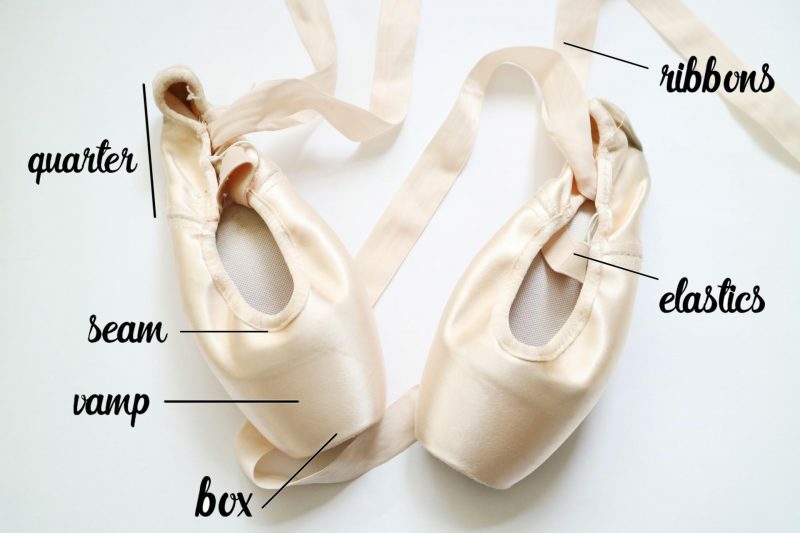 See the link below to sewing your pointe shoes correctly. 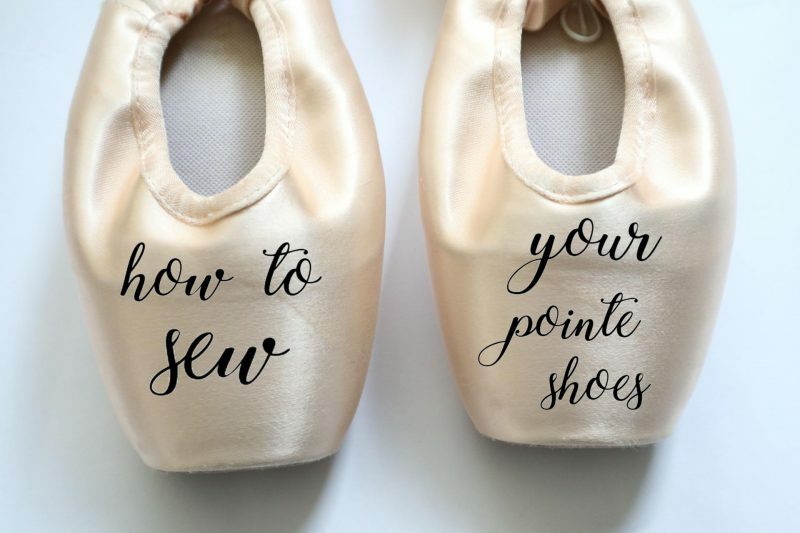 Look out for more posts from our ‘To the Pointe’ series where we look into pointe strenghtening and conditioning including top tips for being ‘en pointe’ and looking after your shoes. See our Pinterest board TO THE POINTE for even more ideas for beginners in training!